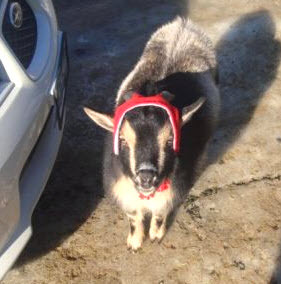 Keep your goat’s head warm with a homemade hat! Measure your goat. Draw the shape for the hat on a piece of newspaper with holes for your goat’s ears and horns, cut out the shape, and use the paper template to cut out the shape from two thick fabrics. Put the fabrics together with the outsides facing inward and sew the edges together, sewing the end of a string into either of the side flaps of the hat and leaving a small hole at one spot. Turn the fabric out right through the hole and sew pom-poms onto the strings. Put the hat on your goat and tie the strings under your goat’s chin.